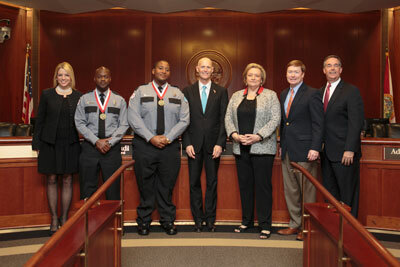 TALLAHASSEE, Fla. - Today, during a meeting of the Florida Cabinet, Governor Rick Scott recognized two Polk Correctional Institution officers with the Medal of Heroism for their brave actions to rescue a driver trapped inside a burning vehicle. Governor Scott said, "I'm proud to recognize Officer Estevin Taylor and Officer Bryan Childs for their quick response to save the life of an injured driver. Their heroic actions are a great example of the great men and women who protect our state every day, and I am honored to present them with the Medal of Heroism." Florida Department of Corrections Secretary Julie Jones said,"Thank you Governor Scott for recognizing these two heroes within the Department. Officer Childs and Officer Taylor witnessed a single car accident and, even as a deadly fire began, immediately took action to free the trapped driver. Their actions in that moment showed true selflessness and bravery, and I could not be more proud of them." On April 4, 2016, Officer Bryan Childs witnessed a car accident while driving to work. The driver's side door was jammed shut and the vehicle had flipped onto the passenger side, trapping the injured driver inside. Officer Childs immediately contacted 911 as he saw a fire start within the vehicle. Officer Estevin Taylor arrived on scene and retrieved bolt cutters from his vehicle to break the windshield. Officers Childs and Taylor pulled the driver from the burning vehicle seconds before it was engulfed in flames. Both officers remained with the driver while emergency personnel arrived on scene.